Communications On-the-Move (COTM) is an enabler. The technology allows those who protect, defend, and serve to be in constant communication with one another, with command structures, and support facilities, regardless of location. COTM affords no-matter-where communications for the warfighter. As part of this issues coverage, COTM is brought to the forefront. A number of subject-matter experts were queried regarding their analysis and expectations of COTM. For everything from training programs and videoconferencing to entertainment programming for soldiers, satellite transmissions play a prominent role in the militarys global communications strategy. While satellite will continue to be a critical transport mechanism for the military to deliver signals out of remote areas, in many situations, a fully managed, fiber optic network offers a superior option by offering lower latency, increased flexibility, and additional value. Communications-on-the-move (COTM), broadband-on-the-move, or next-generation mobile satellite systems, have been discussed for a number of years, particularly for military use. COTM generally refers to on-the-move systems of at least 60 mph with throughput levels of 2 Mbps for inbound and outbound traffic. Within the satellite industry, whether on the military or commercial side, the agency- or company-wide framework that incorporates all of the computing, information and management systems is known as the Enterprise Architectur (EA) or Solution Architecture. EA is the model for the operation and organization of a company, agency, command, and so on, as defined in various documents that deal with the structure and formation of various information systems or services. The leader of the Advanced Extremely High Frequency (AEHF) satellite communications system delivery is Colonel Michael D. Sarchet. He is the Commander for the Protected Satellite Communications Group, Military Satellite Communications (MILSATCOM) Systems Wing, Space and Missile Systems Center (SMC), at Los Angeles Air Force Base. AEHF is designed to aid all warfighters by providing secure, survivable communications, no matter the level of conflict within which such needs to be employed. COMMAND CENTER: Dave Helfgott, President and CEO, DataPath Inc.
DataPath Inc. is well known for establishing and maintaining communications anywhere in our globe, delivering total network control, even in the most extreme conditions and under the most urgent time frames. With their wholly-owned subsidiary, SWE-DISH, DataPath creates satellite and wireless based network solutions and mobile satellite communications systems that solve communications challenges. Based in Duluth, Georgia, U.S.A., the company operates via dozens of offices, distributor locations and field support bases around the world. 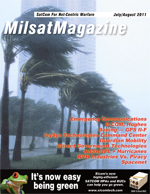 Wideband MILSATCOM spectrum monitoring recently came into the 21st century with the initial fielding of the Wideband Global Spectrum Monitoring System (WGSMS) to the U.S. Militarys Camp Roberts in California, and Fort Buckner, Okinawa. Wideband SATCOM Operations Centers (WSOC) Follow-on installations are scheduled for Fort Meade, and Fort Detrick, in Maryland, and Landstuhl, Germany, WSOCs in the coming months. Persistence, on-demand, real-time Intelligence, Surveillance, and Reconnaissance (ISR) and the ability to deliver weapons without putting an aircrew at risk, are what typically come to mind when the subject of Unmanned Aircraft Systems (UAS) is discussed. This mindset is reinforced by operational successes in Iraq and Afghanistan as well as in non-combat and domestic applications, such as border security and disaster response missions (i.e., monitoring forest fires and assessing flood damage). Unless you are a communications specialist, or frequency manager, rarely do conversations gravitate toward the importance of the communications links that make UAS operations possible. Today, satellites provide essential services to the public and the military environs. Those services include communications, navigation, weather, and scientific information, which has raised the standard of living and daily use of technology in the United states to the highest level in the world. When disaster strikes, such as an earthquake or a tsunami, co-ordinating a response is often hampered by lack of information, or the ability to communicate to emergency services, governments, and aid organizations. Without information about what is needed and where, support can easily become redundant while, conversely, others receive no help at all. A key use of new satellite equipment is as a communications center, to gather and map information and intelligence about the impact of the disaster, and to direct the recovery effort. The Army Signal Community has successfully integrated the first Regional Hub Node (RHN) into the South West Asia Theater of Operations strategic network. The newest asset will support the warfighter through the three-fold combination of satellite communications transmissions capability, user services through Global Information Grid connectivity, and Network Common Operating Picture with Network Management systems. In addition to the listed functionalities, the RHN provides a limited set of common user enterprise services, including VoIP call management, file transfer protocol (FTP) / trivial file transfer protocol (TFTP) servers, and anti-virus software. by Edward Topasna, Program Manager & Marc LeGare, CEO - Proactive Communications Inc. In the aftermath of natural disasters, military and other first responders often face enormous communication challenges that inhibit their ability to efficiently manage crises. If properly deployed, satellite telecommunication networks are the most effective way to ensure the phone, email, and Internet connectivity necessary to support federal, state and local emergency personnel. These satellite networks have proven to provide a reliable transport mechanism for all types of traffic in environments that are complex and difficult to integrate.